Ask fellow campers about "Cottonwood Inn & Suites" and nearby attractions. Easy to get in/out of off US-2. Interior road easy to navigate and back-in sites at good angle to back in. Small campground has gravel road and sites. Utilities are mid-site and worked well. Level sites. Wifi worked well most of the time. Strong Verizon signal. Bathrooms and laundry clean and nice. Frequent train whistles. Would stay here again. We camped at Cottonwood Inn & Suites in a Fifth Wheel. Easy access on US 2. Great place for a one-nighter. Site was level and everything worked. Would stay again if needing a quick, clean stop. They have a restaurant and a mini-casino. Check in at the hotel desk, very friendly staff. We camped at Cottonwood Inn & Suites in a Travel Trailer. This is an RV park connected to a motel. Everything is very clean, check-in is simple and staff are very nice. RV parks generally don't have very good WiFi, but its nice and strong here. A good place to stay. We camped at Cottonwood Inn & Suites in a Motorhome. 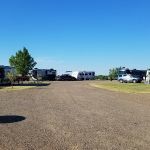 Excellent small RV park at a hotel/casino with restaurant. All the amenities at hotel can be used. Easy check-in; clean sites; nice space between sites; hook-ups placed well. Wifi was excellent. We camped at Cottonwood Inn & Suites in a Motorhome. Glasgow officially in the "Middle of No Where" - T-shirts $10 downtown. Fort Peck Dam area worth the trip! Very nice for our overnight stay. Convenient and easy to get to. Nice long site with good hookups. Great wifi. Behind hotel, use of pool included. Neat and clean. Small dog walk area, but they did have a full bag dispenser. Too bad some people can't be bothered to pick up! We camped at Cottonwood Inn & Suites in a Motorhome. Great for one-night stop on our way to Glacier. It was quiet, roomy and easy in/out. 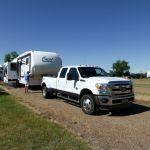 We camped at Cottonwood Inn & Suites in a Fifth Wheel. A surprisingly good, small RV park behind the hotel. Very easy access thru hotel paved parking lot. RV park roads & sites are excellent packed gravel, among the most level we've found anywhere. Our site was back-in; there are some pull-thru as well. Good grass space between sites. Hookups are perfectly situated on their own small concrete pad. Water at 55 psi is great, even tastes ok too. Trees are small so satellite tunes perfectly. WiFi is among the best we've experienced (and we've visited 300 parks). It's great for a stopover and I really wouldn't mind spending several days here. It does seem a bit overpriced, however: $41 less AARP discount plus taxes= $39.59/night. We camped at Cottonwood Inn & Suites in a Motorhome. Make a reservation. Small good park is full. We stayed here overnight. Small park FHU, Nice folks. Did laundry. Nice park will stay here again if passing through. We camped at Cottonwood Inn & Suites in a Fifth Wheel. This is a nice park for overnight stays. It's a bit on the expensive side they do have a captive audience. We got a full hookup pull thru site, good 50 amp. WiFi works great. My wife went in and used the very well equipped fitness room. Has a pool, hot tub, bar restaurant and casino but we didn't use any of them. Would definitely stay here again. We camped at Cottonwood Inn & Suites in a Motorhome. RV park is behind the motel but you have access to all amenities of the hotel, including the indoor heated pool. Wifi worked great. Was more expensive than I had expected but the amenities made it worthwhile. We camped at Cottonwood Inn & Suites in a Travel Trailer. There is a restaurant attached to the motel. We did not use it but it was convenient. RV park is part of the hotel operation. However this was not a destination RV park for us just a one nighter on our journey. OK but overall very plain. Sites had electric, water and sewer. They were open with no trees. Drive was easy in and out. Facilities were secured with a code. Had a coin operated laundry by the bathrooms. One could use the hotel's pool and hot tub as part of the fees but we did not. We did not feel the park was worth the cost but options were limited in this part of Montana for us. Good Sam discount helped reduce the cost. We camped at Cottonwood Inn & Suites in a Travel Trailer. Good pizzas restaurant and grocery store were just a block or two away well within walking distance. 50 amp, FHU, back-in site. We've stayed here before and the price keeps going up but no services are added. Not much competition nearby which does not help. No cable, OTA TV signals are available. WIFI worked well. There was land grading going on in a lot immediately behind us and the noise started at 8 AM and was quite loud, which detracted from the quiet of the area. We were told that the INN would be adding more rooms and consequently RV sites will be removed. If we passed this way again we would attempt to schedule our arrival in another area to avoid this one in the future. We camped at Cottonwood Inn & Suites in a Motorhome. Attached to Cottonwood Inn with check-in at the hotel front desk. Roads were easy to navigate and site was long enough for our tow. Sunny/Open sites that were gravel with picnic table. Restaurant inside the hotel was good and staff friendly. We camped at Cottonwood Inn & Suites in a Motorhome. Fort Peck dam/Lake & Museum is worth a trip. sunset there was gorgeous. Theodore Roosevelt National Park was a 3-hour drive but was via a scenic by-way that was beautiful. Albertsons and Reynolds grocery stores were nearby west on rt 2. Are you affiliated with Cottonwood Inn & Suites ?